Kathleen T. Foote, Ph.D. – This website provides a snapshot of my professional interests and activities. My name is Katie Foote. I’m currently working as a Science Education Specialist in at the University of British Columbia in Vancouver, Canada. I work with physics faculty to help them take a more research-based approach to teaching. From 2015-2017, I worked as a Professional Teaching Fellow at the University of Auckland in New Zealand to start Studio Physics for their introductory courses. I received my Ph.D. in Physics Education Research at North Carolina State University under the supervision of Dr. Robert Beichner, the developer of SCALE-UP in the mid-1990s. 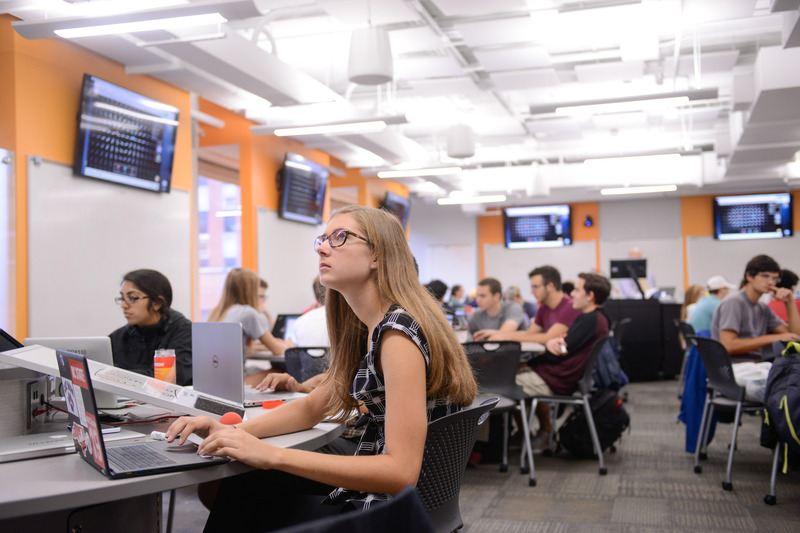 New SCALE-UP classrooms at NC State. Student Centered Active Learning with Upside-down Pedagogy integrates lab, “lecture” and tutorial in a classroom redesigned to emphasize the students’ learning over the instructor’s lecturing. You’ll find students working on interesting problems as they sit around round tables, presenting using whiteboards on the wall and instructors roaming around since the classroom has no obvious front. Originally, SCALE-UP was designed as an economic alternative to the traditional lecture+lab format for large enrollment university physics courses while using furniture and pedagogy to encourage instructors to use research-based teaching techniques. The benefits were already well documented by the time I arrived at NC State and include increased attendance, improved conceptual learning and problem solving, increased retention (especially of underrepresented groups), improved attitudes toward science and more. Now, similar approaches have spread throughout the world, across disciplines and in classrooms of various sizes. My Ph.D. thesis used SCALE-UP as a case study to investigate larger questions regarding disseminating, implementing and sustaining the use of educational innovations. In addition to engaging with these questions through theoretical research, I have sought opportunities to spread innovative teaching practices worldwide. I have observed classes and/or given talks at prestigious universities worldwide including National University of Singapore, University of Sao Paulo in Brazil, Cheng Chung University in Taiwan, University of Tokyo in Japan, University of Queensland in Australia and more. My talk helped convince the physics department at University of Sao Paulo to adopt SCALE-UP and I ran faculty training workshops to prepare their instructors. I am convinced that the Studio approach greatly benefits student learning but also has remarkable potential to catalyze, spread and sustain teaching innovation. In New Zealand, I convinced the University of Auckland physics department to adopt studio in their introductory courses and I was heavily involved with every step of the reform. I provided advice for renovating the Stage One laboratory (see above), designed the curriculum, recommended equipment, trained instructional staff, set up evaluation procedures and more. I taught and coordinated Physics 120 during the pilot semester of Studio Physics. I contributed to the overall physics departmental review, advising how to integrate active learning to Stage Two and Three courses, even when they are taught in traditional environments. I also earned curriculum development grants from the University to supervise students developing (1) more open-ended labs with an argument-based “extended abstract” report format and (2) developing Jupyter Notebook skeletal programs and YouTube tutorials to explicitly incorporate computation in the second semester course. UBC Active Learning Theatre. Photo courtesy of Katie Foote. At University of British Columbia, I am co-teaching an Advanced Electricity & Magnetism course of 180 third-year students in the department’s new “Active Learning Theatre”. This tiered auditorium space seats students at tables of four and we use handheld whiteboards to engage students on cooperative problem solving during class. Architectural Diagram for New Lab Space. Photo courtesy of UBC Physics. UBC physics is also renovating their lab building to create a more flexible and authentic space. I’ve been leading meetings of upper-division lab stakeholders to leverage the opportunity to rethink our lab curriculum and pedagogy to develop transferable 21st century skills. We hope to specifically focus on developing scholarly communication and teamwork in labs that combine skill modules with project-based labs. In addition to championing for innovative teaching practices, I enjoy teaching and thinking holistically about learning space design. In addition, to my experiences at universities, I have spent several summers as an instructor for Duke Talent Identification Program in China and India, as well as shorter programs in the United States, teaching an active, project based engineering course for gifted and talented 7th-10th graders. I am originally from Farmington, Connecticut, USA. I received my Bachelors degree in Applied Physics & Physics Secondary Education from Providence College. In addition to my interest in physics and innovative instruction, I love to travel and have visited almost 80 countries on 7 continents. I hope you enjoy my website. Please contact me if you have any questions!